The Federal Deposit Insurance Corp. conducted 1,871 safety and soundness exams in 2015, issuing 233 formal enforcement actions and 165 informal ones, the FDIC revealed in its recently released 2015 Annual Report. Those statistics do not include 521 institutions with a composite CAMELS rating of 2 that had Matters Requiring Board Attention identified in exam reports. “The FDIC has heightened its focus on forward-looking supervision aimed at ensuring that risks are mitigated before they lead to financial deterioration,” the report noted. 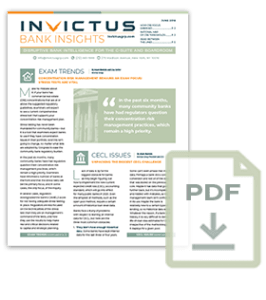 “In 2015, the FDIC concluded a two-year effort to train risk management supervision staff on forward-looking approaches to supervising institutions.” The report also revealed that the FDIC has created a new operational risk branch responsible for information technology policy and exams as well as cybersecurity initiatives. Capital still matters, FDIC Vice Chairman Thomas Hoenig said in a speech at the Federal Reserve Bank of New York’s Conference on Supervising Large Complex Finance Institutions. He stressed that “supervisors must recognize their limits and insist that banking firms hold sufficient capital to backstop management mistakes and simply bad luck.” The most dependable measure of capital, he argued, is the tangible leverage ratio, which is a stricter measure than now required. “From a supervision program perspective, moving away from risk-based capital measures toward an assessment of adequacy based on tangible equity would generate more reliable information from which to make supervisory judgments and would free up billions of dollars from supervision budgets currently spent waiting for, understanding, and implementing risk-based measures,” he said. Hoping to ward off criminal activity, banking regulators and the Financial Crimes Enforcement Network have issued new guidance to clarify Customer Identification Program requirements for banks that issue prepaid cards. The guidance also covers contracts with third-party programs. If your bank has oil and gas assets, be sure to read the updated 84-page Comptroller’s Handbook on “Oil and Gas Exploration and Production Lending.” The booklet advises examiners on the risks associated with oil and gas lending, and gives guidance on evaluating exploration and production loans. It warns against concentrations and says the biggest risks are “credit, interest rate, liquidity, operational, compliance, strategic and reputation.” The booklet also discusses the allowance for loan and lease losses and accrual accounting guidelines for oil and gas loans. The FDIC’s concern about managing third-party vendors continues. Its newest technical assistance video for community bank directors focuses on outsourcing technology services. Regulators want to ensure that community bank executives develop risk- assessment programs for vendor management.